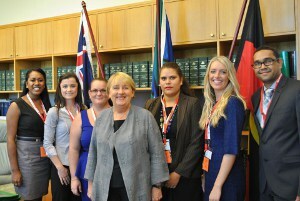 Gemma Church (second from left) and Australia’s other Global Voices delegates meet with Indigenous Affairs Minister Jenny Macklin. A Charles Darwin University student has been selected to represent Australia at a United Nations forum in New York in May. Double degree undergraduate Gemma Church is one of just six Australians selected as part of the Global Voices program to participate in the UN’s Permanent Forum on Indigenous Issues from 20-31 May. “My hope is that I’ll be challenged to learn new information, discover my voice, pursue what I believe in and be inspired to make a difference upon my return,” Gemma said. Gemma has undertaken the research project “Indigenous students in remote communities: culturally relevant policy and pedagogy for improved educational outcomes” as part of her preparation for the program. The research took her to Canberra recently where she met with Governor-General Quentin Bryce, Indigenous Affairs Minister Jenny Macklin and Aboriginal and Torres Strait Islander Social Justice Commissioner Mick Gooda, among others. Gemma, who was born in the Kimberley but grew up in Nhulunbuy before relocating to Darwin, said her lifelong interaction with community organisations had influenced her decision to pursue teaching. “Issues regarding Indigenous schooling have been topical for as long as I can remember,” she said. It is the first overseas trip for Gemma, a high achiever who is in the final phases of a Bachelor of Teaching and Learning/Bachelor of Applied Science program. Gemma is being sponsored by Charles Darwin University to attend the forum.